Works to Stockbridge footbridge have cost almost double the project’s £877,000 budget, a Freedom of Information request has revealed. 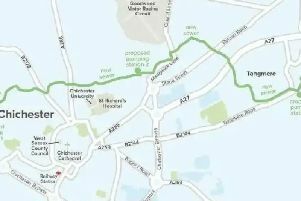 The replacement footbridge over the A27, originally due to open on April 6, is now expected to reopen sometime this week. Remedial works to strength the bridge were required after tests in April and August this year showed the crossing was ‘moving unacceptably in certain conditions’. A freedom of information request submitted by Mr P Bowering to Highways England revealed the total amount spent on the project up to September 10 was £1,701,785. The orginal budget for the footbridge was £877,390. A response from Highways England to Mr Bowering’s request stated that although there was no incentives or penalties associated with early or late delivery from contractors, there was a ‘pain/gain’ adjustment for payment against target price. It added: “Highways England have instructed an independent design review for this project. “This will inform whether there is potential liability with the contractor for the additional works that have been required.